Simple shapes and forms are found everywhere in your own home. 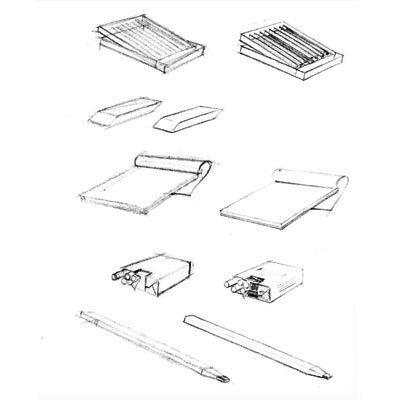 Just fill a sketchbook page with some of most basic forms. All to remember is using line contour variations as you have learned in class, representing lines that vary in thickness and value. The darkest areas are corners and changes in direction of a line. Circular strokes are an important way of describing forms. 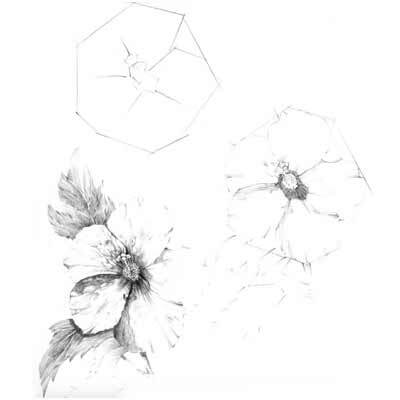 Begin to draw circles by locking in your wrist and draw from the shoulder and your whole arm. Draw small and larger ones all over the place. 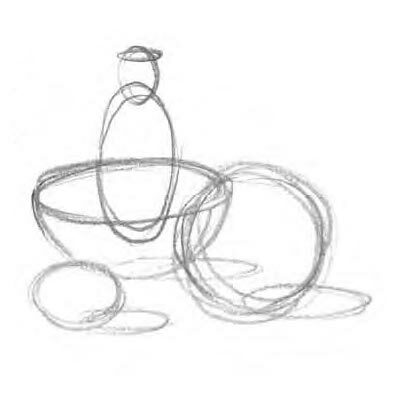 Once warmed up, create a still life with form and draw all shapes, even cylinders or rectangles as circles or ovals. This exercise is for the purpose to let you free of precision. The goal is to detach from the usual goal of being precise, which when used as the only means of drawing will stiffen your creativity and work. 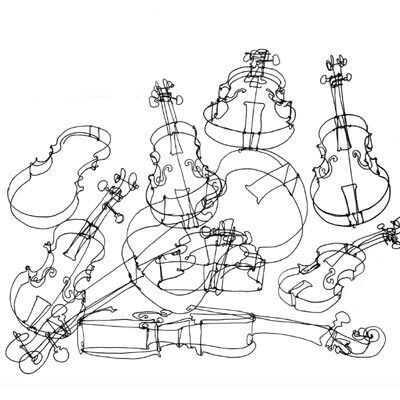 Find an interesting subject and draw it in one line without ever lifting the pencil from the page until one form is complete. It is challenging as refreshing. Today we are looking for simple forms around the house and concentrate on only two to three value tones only. Just light and dark with a little hint of some mid tones. That's it. Anything from stones, flowers, a piece of wood will do. Use a few concave and convex forms, such as an egg or a bowl. 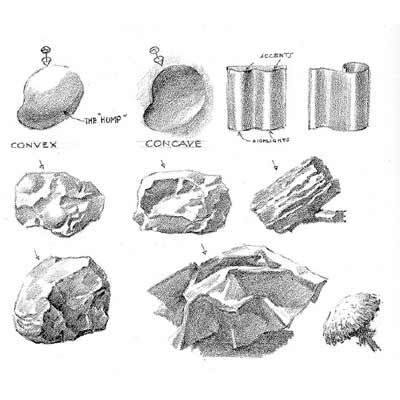 Start warming up with a few basic geometric forms that comprise the structure of the shell, as seen on the left. The concentrate on one or two shells. You can use the image provided, but if you have any shells at home, use them. The best way of drawing a car is to imagine that the car is set into a box. 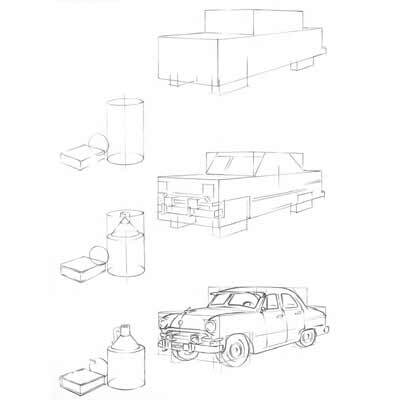 By drawing boxes first, your car automatically looks correct in perspective. Warm up with a small cylinder drawing as seen on the left. When drawing one of our furry friends, it is very important that you mainly get the overall shapes first. Instead of drawing every single hair of the fur, simplify by drawing shaded areas with broad hatching as seen on the right. 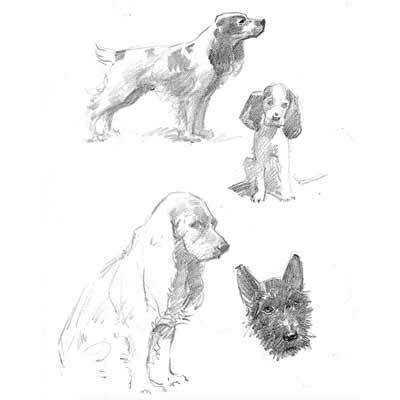 The goal is to get the main features without too much detail and rather draw a couple of dogs. When drawing the base outlines, do this rather with straight instead of curved lines first. You can later round them up. Like yesterday do your shading with line hatching. You may even want to warm up first with some hatching first. Remember that hatching can look extremely confusing if each stroke is not neatly placed to the next. The all should be placed parallel to one another, with similar distances. If you have problems, ask to do some warm-up exercises in class this week. Some of you may find this not the sweetest subject to draw, but it is a good exercise. Begin with the outlines as usual and then draw in some areas the pattern of scales. Leave some parts out, so not to overwork this simple drawing. Then add the triangular shading on top of your scales. 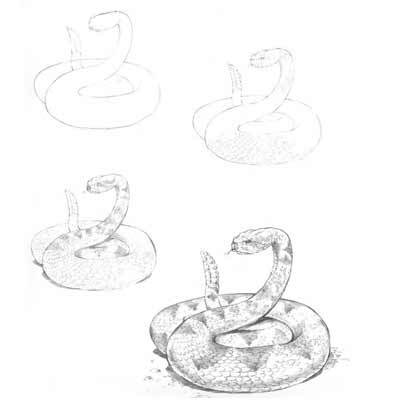 Add the eyes and some details on the famous rattle of this particular snake. 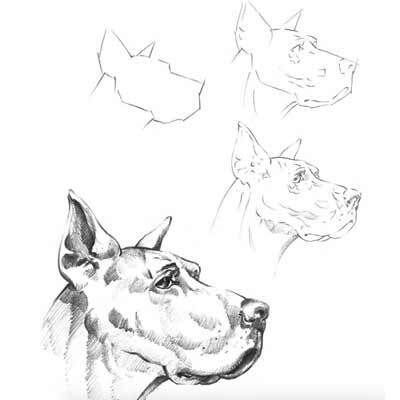 We are still concentrating on outlines with contour variations and add only a little information in regards to shading in the form of hatching. 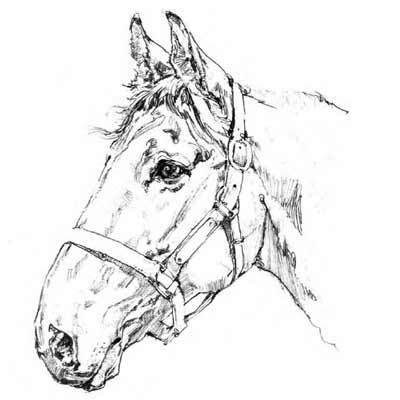 Today we draw the complete horse. 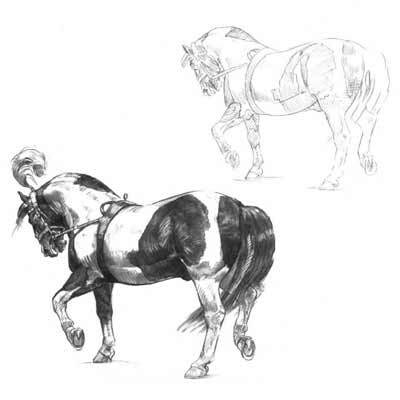 Outline the contours of the horse and then add all mid tones. Last you add the darker areas. I would suggest that you use a HB pencil for the initial outlines, a 2H for the mid tones and a 2B for the dark areas, with some fewer details even darker with a 6B pencil. Once again, the goal is to get the overall proportions right by starting off with a fine line contour which then be thickened in certain areas. Add very few shading details only with some hatching. Today you can rest or finish some of your incomplete works. 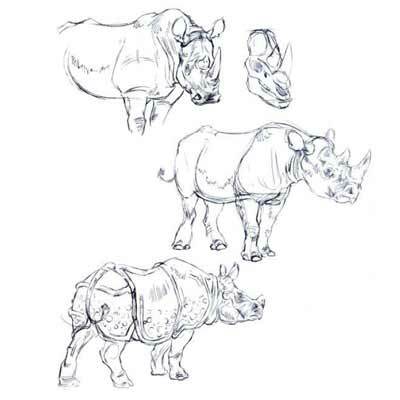 You can also continue doing some animal drawings. Outline Iris with rather straight lines instead of round, this simplifies to see directions of shapes. Use a 2H to start fine fine outlines, continue to draw all mid tones or lighter with the same pencil. Add darker areas with a 2B or darker. 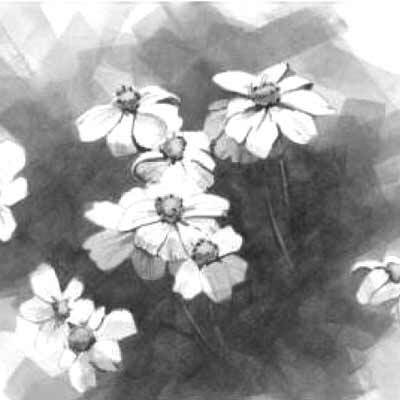 The pedals of a flower are very soft avoid any roughness by keeping your pencils very sharp at all times. 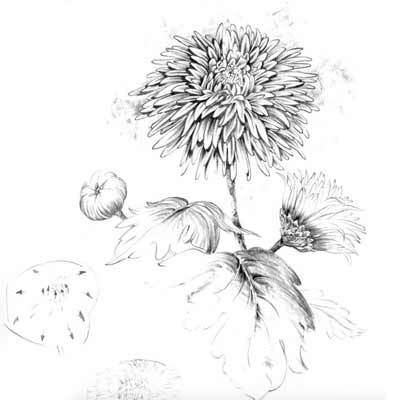 Today is a bit tougher, as the Chrysanthemum has a lot of pedals. So the first thing you need to do is drawing a circle where you see the pedals falling inwards rather than outwards. Then look for outlines, that is where a row of pedals are ending either in a line or a curved line. Always start with the larges pedals first, that counts for all any flowers you might draw. 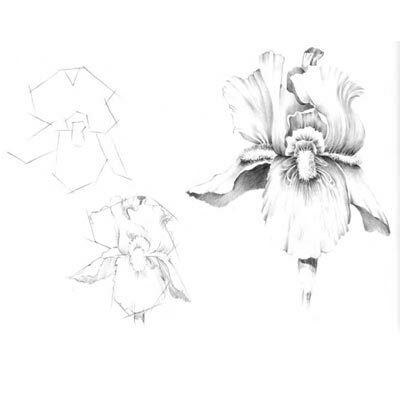 First, outline the five major pedals of the Hibiscus plant by using straight lines to depict the angles. Then add details for the darker areas with a 2B or darker and 2H or lighter for all mid-tones. 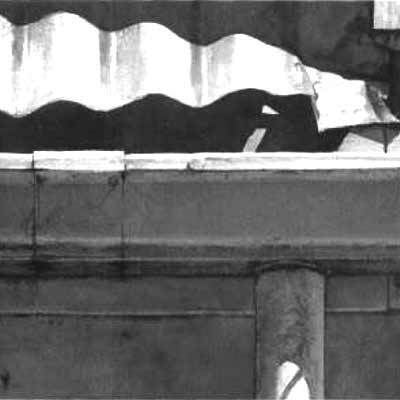 Don't forget to leave a lot of white areas, so that your drawing ranges in contrast from complete black, through mid-tones to absolute light. 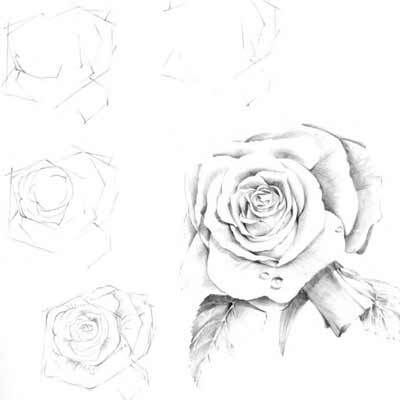 With a 2H pencil draw lightly the outlines of the rose by using straight lines instead of curved to make it easier for you to see angles clearer. It is important that you begin with the larger pedals first as this takes much of the confusion we often feel when we confront too many details. The left side of the brain wants to shut down. So you have to slow your brain right down, breath deeply and concentrate on the larger areas first. You will see that in the end, the details weren't too bad at all. Today we use a completely different method and draw from dark to light. First, cover the whole area with a 2H in all lighter areas, a HB for all mid-tones and a 4B for all darker sections. You must take caution not to press the paper tooth too harsh, the graphite needs to be applied only lightly. Then use your putty eraser to take out all lighter areas representing pedals, while leaving the darker inner parts of the flower. Then use a normal or electric eraser to clean up hard edges. Leave some soft edges. Once more we work from dark to light. Like yesterday, cover the whole image with to the value of the main wall. Use the putty eraser to take out all lighter sections. Sharpen edges with a normal eraser and add the darkest areas by using a 4B pencil. 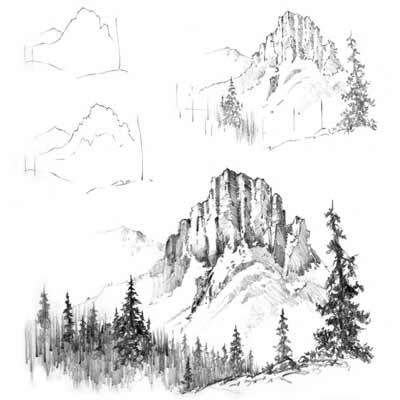 To soften the mid tones and dark components you are allowed to use a paper stump for this task to smooth things down at the end, but leave the lighter areas alone and draw them by hand with a lighter 4H pencil. Yeah, you've made it. And if not, don't be discouraged. Never let yourself down for having missed classes. It takes a usual 30 days to turn a behaviour into a habit. All you need to do is start again and dismiss days you left out, relax and continue. We bring some nature into our theme this week as we dwell into rock formations and landscapes. 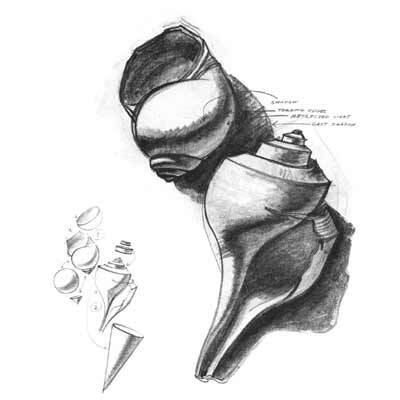 Begin as usual with a light pencil to create outlines of proportions. Continue with darker areas on the top of the mountain with a HB or 2B and then move to the trees in front. The last details should be added within the lighter parts of the mountain with a 4H or 2H. Remember the rule is to start with the dark first, as we otherwise tend to overwork light sections by far too easily. 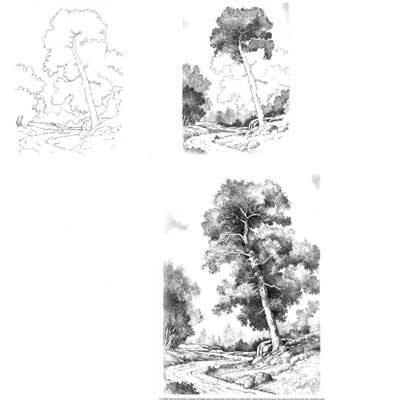 Draw the outlines with a 2H lightly, than add the darker sections within the tree with a HB and in the darkest aereas a 4B. Use circular motion for all trees and bushes. 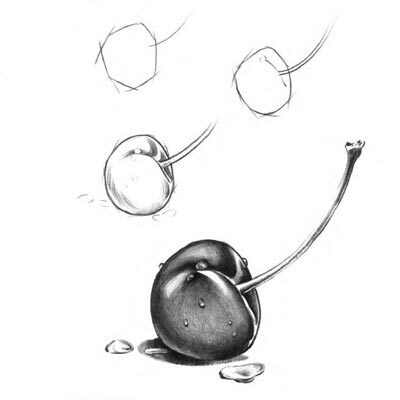 Today we are going to draw a cherry or some other smaller fruit with a glossy surface. The aim is to catch detail. You may even put some water drops onto the cherry for interest. Create outlines with a 2H pencil by trying to establish straight lines rather than round. The only way you can get a very smooth surface is by using harder pencils between 6H and 2H and having the pencil very sharp at all times. Study all light and dark's very carefully. 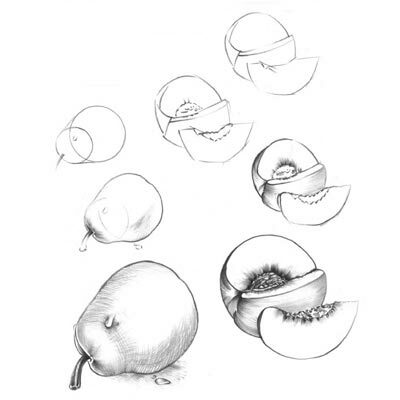 With a 2H pencil capture the basic form of the fruit. Use rather straight lines, as most fruit is not round at all. For the pear though you can see that it is made of two overlapping circles. So study your fruit to determine which approach is better. Add shading by using mostly only a 2H or even 4H pencil. For the darker outlines use a 4B, but only by applying line contour variations. Oh no not again! Yes another fruit folks. Practice makes perfect. 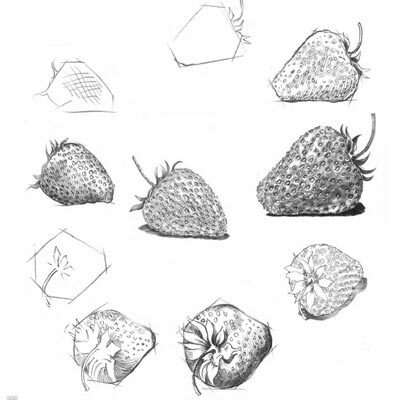 Outline fruit with straight lines and round them up, all with a 2H pencil. Study if the dots of the strawberry have a sort of pattern or are all just random. To make it easier you can use an embossing tool to impress small dots for the pores. Watch that the dark outline surrounding the white pores is darker on one side and lighter on the other. Then add shading with pencils from 4H to 2H. Last draw some nice line contour variations. 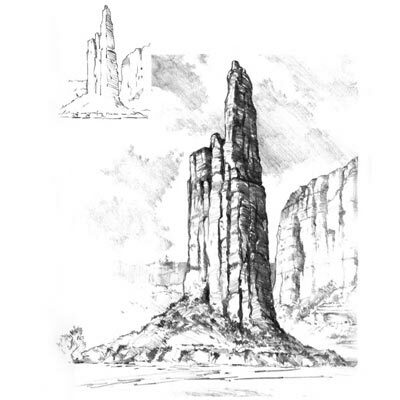 Draw a small rock formation by outlining the planes of each rock with a 2H pencil. Vary between round and straight lines. 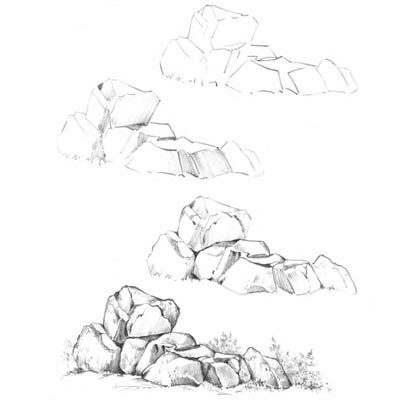 Rocks can be very contrast rich, so make sure you use the whole range of tonal values for its 3 dimensional effect. Add some grass or small bushes to soften the image. And ones more to deepen your knowledge of rocks. Use the same method of the previous day. You are allowed to use different types of pencils or pens, such as using a ball pen or pure graphite instead. Today we will combine what we have drawn in the last two days and add some more features such as still water and trees. 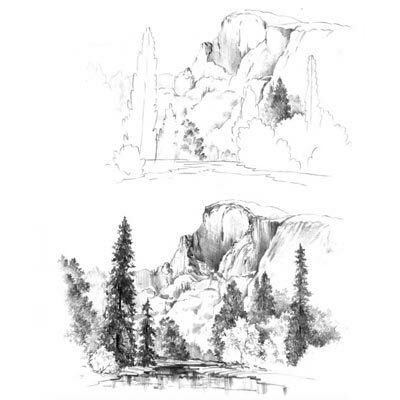 After you have drawn the outlines and added all tonal values and details, re-check if the focal point, the trees in the front and parts of the water, are in fact have the darkest value compared to the rest of the image. 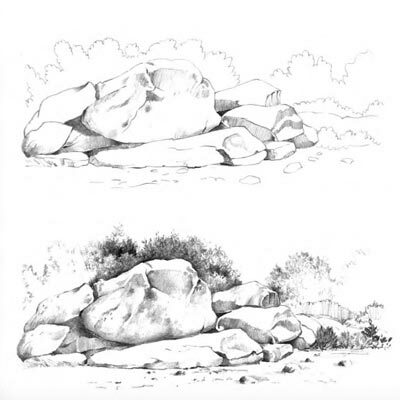 This will be our last rock formation landscape drawing for some time. Images of the following books have been used, which I recommend as the best source for this drawing challenge. You can order most of them Online. If you want to buy only one book, I advice to get "The Art of Basic Drawing" by William F. Powell.